If you didn’t know, last week it was my 19th Birthday and I was lucky enough to receive some presents even though I had absolutely no idea what to ask for. The older I get, the less I actually want so I did receive some month and gift cards as well as a few bits and bobs. After asking on Twitter what you all would like to see next on the blog, a birthday haul was voted for most so ... let’s get into it. Morphe Brushes have to be my favourites for applying my makeup as they’re all very good quality but they’re also very well priced as well. After seeing that Beauty Bay was dropping Morphe from their website, I realised they were having a sale so I just had to ask for some. I received the MB23, R44 and the M527 Some of the other Morphe brushes that I absolutely love are the M404, for brushing away excess powder when packing and the M139 as it’s such a small blending brush it helps to get to the harder to reach places and also to create a finer blend of colour. The MB23 is a large blending brush, which is super soft and blends the shadows seamlessly ... and easily which my arm is thankful for!! The M527 is a big fluffy brush that I use for bronzer and it’s the perfect dupe for the MAC 135S, which I’ve had my eye on for soo long now and this one is like a 3rd of the price and works perfectly. Next up is the Real Techniques Blush Brush, which I have actually wanted for quite a while but just didn’t think I needed it as I have lots of different brushes that do the job just fine. However, this brush is just as good as I had imagined and how I wanted it to be. It’s the perfect size, shape to cover the apples of the cheeks, it’s very fluffy to makes it easy to blend out and it also picks up a good amount of product, without making it look like you’re wearing too much. I needed a new mascara and wasn’t quite sure which one to ask for, so I came across the Soap & Glory Thick and Fast High Definition Collagen Coat Mascara (probably the longest name ever) and I thought I’d give it a go as I haven’t really used many S&G makeup products before. I really like this mascara as it lengthens the lashes, doesn’t make them clumpy, makes them really black and separates they whilst giving them a curl, however it does give a very natural look and can look like your haven’t got that much mascara on after a while and that isn’t a look that I like. But if you like the natural look then this mascara could be right up your street. 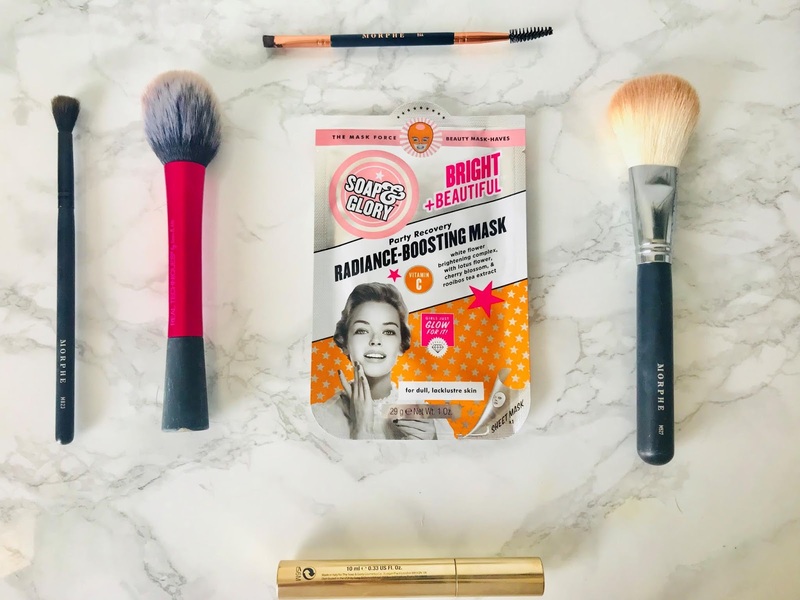 Soap & Glory Bright + Beautiful Radiance Boosting Face Mask. I haven’t actually tried this mask before (I don’t think I have anyway!) but I absolutely love the S&G Eye sheet mask so I have high hopes for this one. They’re really well priced at £4 (which is between high end and drugstore price) and I know it’ll do wonders for my skin. If I like this then I’m sure you’ll hear me raving about it a lot on my blog in the coming months. I actually asked for the Boohoo Pom Pom Pyjamas next, as who doesn’t love a cute pair of pjs to wear. I find a lot of my pjs are like joggers and loungewear, which are quite wintery, so I wanted something a little better for the summer and I actually really like these. There isn’t much I can say about these pyjamas but you can take a look at them here. Last but not least, I received a Boots Gift Card from one of my friends (thankyou Soph if you’re reading) and I’ll probably do a Boots Haul or something in the near future as you all seem to love those sorts of posts and I love sharing my new purchases with you, so make sure to keep yours eyes peeled for that. Thankyou so much for taking the time to read this post, I really hope you liked it and I’ll see you soon with another! !